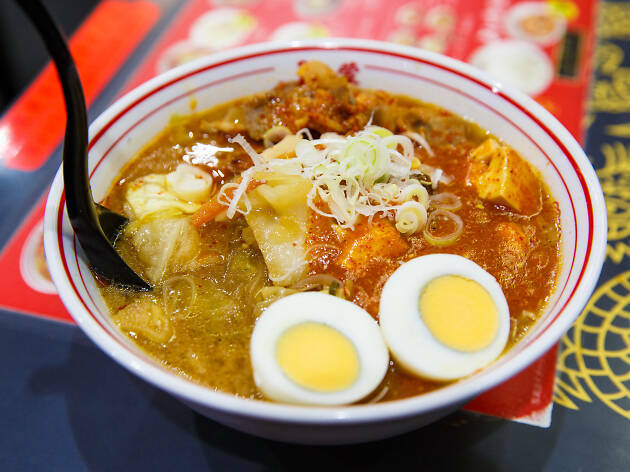 The Nakamoto restaurants are famous for their spicy ramen, and this flagship shop – right by Kami-Itabashi Station on the Tobu Tojo line – is the best of the bunch. The deep red broth gets its fiery, flavourful heat from a spicy miso sauce, which melds gloriously with rich tanmen umami, sweet cabbage, carrots and garlic. While the other branches – and there are 15 to choose from – also serve up spicy noodles, only the flagship restaurant offers the authentic Nakamoto flavour. There are plenty of soups to try, including the standard mouko tanmen (¥800), the milder miso tanmen (¥780), and the tsukemen-style hiyashi gomoku mouko tanmen (¥880). 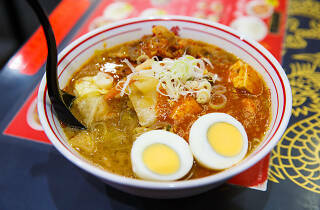 Dishes are rated for spiciness on a scale from 0 to 10, and risk-takers who want to put their tongues to the test should go for the eye-watering hokkyoku ramen (¥830). Just don't blame us if you get a stomach ulcer afterwards.